Here is something funny I found. 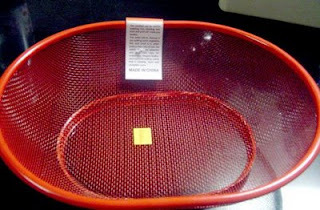 My mom bought a red basket from the market which was "Made in China" (and so was the language used on the label). Seems like a simple red basket, nice colour and all, but on closer inspection, checkout what's written on the label....haha...hilarious! This is what the label says, "The product can be used in washing rice, cleaning rice bran and grail will you bealthy". BEALTHY!! What is Bealthy??!! Bealthy, Wealthy and Bise? 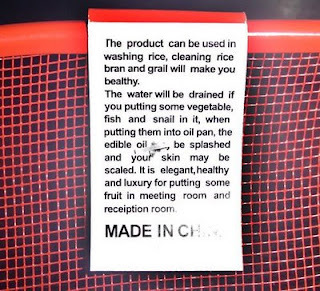 There's more..."The water will be drained if you putting some vegetable, fish and snail in it"...woah really specific here, I guess other meats like chicken don't fit in the basket. Ok this is the best part... "when putting them into oil pan, the edible oil may be splashed and your skin may be scaled." woaahh that's really scary design there. And then immediately after that "It is elegant, healthy and luxury for putting some fruit in the meeting room and reception room". Getting so specific again, I guess this counts out dinner room or bedroom. Haha...you really gotta love the chinese, they are a funny! Hehehehe it sure is super funny Nik. How you doing bro? Should visit your blog now to know wots happening with you. Keep it coming! when I went to China, we flew on a domestic flight, about one hour.